Submitting a comment for a federal or state notice of proposed rulemaking is one of the simplest and essential ways for the public to participate in the rulemaking process. ACS’s Notice and Comment initiative identifies opportunities to comment on key regulations put forth by federal and state agencies. ACS monitors the federal register for notices of proposed regulatory changes and highlights select opportunities that may be of interest to our members. ACS encourages our members to write and submit comments, but we are also looking for volunteers to research comments and provide expert talking points to guide comment writing. For more information, check out our Notice and Comment Webinar. Please email LCEmails@acslaw.org with the subject line “Notice and Comment” for more information. ACS is expanding its Notice and Comment Project, which monitors regulations and policy-making and then highlights select opportunities that may be of interest to our members, to include all 50 states. There is currently no single location to find proposed regulatory changes for all 50 states. Not only that, but many state proposed regulatory changes are difficult to monitor and not easily accessible to the general public. ACS is looking for volunteers to monitor, on a weekly basis, state notices of proposed rulemaking. Please email LCEmails@acslaw.org for more information. The Centers for Medicare and Medicaid Services (CMS) extends the public comment period to April 30 on a proposal that would use a risk adjustment model that would take into account the number of conditions an individual beneficiary may have. Critics say that changing the risk adjustment model would reduce risk scores for dual-eligible patients and reduce payment to Medicare Advantage plans. Read more from Health Affairs and Healthcare Finance. The Securities and Exchange Commission (SEC) seeks comment by May 2 on a proposal that would amend “fund of funds” rules. The rules would allow a company to invest shares of another fund without being subject to regulations that cap the amount of voting stock and total assets the fund can acquire. Read more from JD Supra. The Centers for Medicare and Medicaid Services (CMS) seeks comment by May 6 on strategies that would allow enrollees to purchase health insurance across state lines in an effort to increase competition and improve affordability for consumers. Health policy experts argue that allowing insurers to sell across state lines would do little to lower health insurance premiums. Read more from Modern Healthcare, HealthPayerIntelligence, and The Hill. The Federal Deposit Insurance Corporation (FDIC) seek comment by May 7 on whether its decades-old rules regarding deposit insurance to banks that have more than 10% of their total deposits in “brokered deposits.” Critics claim that loosening restrictions would allow banks to use brokered deposits to fund risky loans, or “gambling for resurrection.” Read more from American Banker. The Environmental Protection Agency (EPA) seeks comment by May 10 on an advanced notice of proposed rulemaking considering, among other things, easing restrictions regarding adding liquids to municipal solid waste landfills (MSWLFs) which promote accelerated biodegradation of waste. The current notice is extending the comment period deadline. Read more from EHS Daily Advisory. 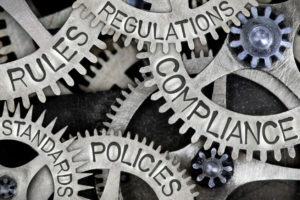 The Financial Stability Oversight Council seeks comment by May 13 on a proposal to shift its focus from oversight of individual nonbank financial services companies (such as AIG, previously) to an “activities-based approach” to identify market wide risks. Critics have argued that the proposal, in conjunction with the Federal Reserve’s adjustment of its annual “stress tests,” will lead to less transparency and more volatility in the financial system. Read more from The New York Times, Fortune, and Compliance Week. The Consumer Financial Protection Bureau (CFPB) seeks comment by May 15 on a proposal to delay the compliance date for the ability-to-repay (ATR) provisions of its 2017 payday lending rule. The rule created underwriting requirements for high-cost, small-dollar lenders, and limits on how often a lender can attempt debiting payments from a borrower’s bank account. The CFPB has also proposed to eliminate the underwriting portion of the rule, but a U.S. district judge stayed the rule’s implementation. Read more from Time, American Banker, and a letter on behalf of 25 State Attorneys General. The Department of Labor (DOL) seeks comment by May 21 on a proposal which would, among other things, extend eligibility for overtime (and minimum wage) to include most salaried workers making less than $35,000 a year. The change would cover about 1.1 million additional workers. The Department is proposing to review and update the salary threshold every four years. Read more from Forbes, Lexology, and The Legal Intelligencer. The Department of Defense (DOD) seeks comment by May 31 on a proposed amendment to the Defense Federal Acquisition Regulation Supplement (FARS) to implement a section of the National Defense Authorization Act, which requires DFARS to be updated to include an instruction on a demonstration project for contractors employing persons with disabilities. Read more from Federal News Network. The Office of the Comptroller of the Currency (OCC), the Board of Governors of the Federal Reserve System (Board), and the Federal Deposit Insurance Corporation (FDIC) seek comment by June 7 on a proposal to discourage large banks from investing substantially in debt issued by other large peers, which would lower the impact of large bank failures. The proposed rule could reduce the effects of a financial crisis if a bank were to fail. Read more from Financial Regulation News. The Food and Drug Administration (FDA) seeks comment by July 2 on a public hearing to obtain information on how to regulate products containing cannabidiol (CBD) and related compounds. Currently, federal law prohibits CBD in food or supplements, but California, Texas, and other states are crafting laws that would allow the sale of CBD. Read more from The Washington Post, CNN, CNBC, and The Associated Press. Members can also search the Federal Register for other comment opportunities. The California Division of Labor Standards Enforcement seeks comment by May 20 on a proposal to set standards for sexual harassment prevention training for janitorial employers. The proposed requirements are a result of California Assembly Bill 1978, passed in 2016. The bill was in response to reports of sexual harassment and abuse in the janitorial services industry, especially of immigrant women. Read more from JD Supra, the California Chamber of Commerce, the UC Berkeley Labor Center, and Reveal. See pages 526-532 of the California Regulatory Notice Register for further information. Comments may be submitted by email to DLSERegulations@dir.ca.gov. The California Emergency Medical Services Authority (EMSA) seeks comment by May 20 on a proposal to clarify the training standards and curriculum for tactical casualty care principles. The proposals require standards for coordination between emergency medical services personnel during terrorism incidents or active shooter events, and standards to help paramedics asses whether a patient is in a “non-emergency” condition. See pages 538-542 of the California Regulatory notice Register for further information. Comments may be submitted by email to esam.el−morshedy@emsa.ca.gov. The California Department of Corrections and Rehabilitation (CDCR) seeks comment by May 29 on its proposal to eliminate copayments for health care services for health care services for inmates. CDCR determined that copayments have minimal fiscal benefit and may hinder patients from seeking care for health issues which may become exacerbated, resulting in increased treatment cost. Read more from the Ella Baker Center for Human Rights, and Initiate Justice. See pages 535-538 of the California Regulatory Notice Register for further information. Comments may be submitted by email to CCHCSRegs@cdcr.ca.gov. 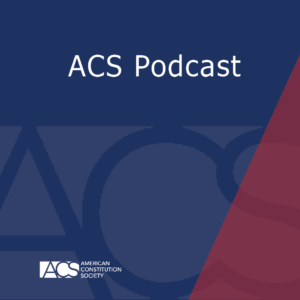 On September 19, ACS hosted a webinar on notice and comment procedure. Whether you care about environmental regulations, conditions for millions of workers across the country, financial controls, or any number of regulatory issues, this valuable training seminar covers the basics of the process that underlies all regulatory action with two seasoned experts. Notice and comment is a key oversight tool for agency activity, particularly in the current political environment, and it’s also a great way to develop knowledge in a particular area of the law. Whether you are an experienced practitioner or a law student still developing your experience, you can participate in notice and comment procedure to bring about change. Get involved in the federal regulatory process. Submitting a comment for a federal or state notice of proposed rulemaking is one of the simplest and essential ways for the public to participate in the rulemaking process. ACS’s Notice and Comment initiative identifies opportunities to comment on key regulations put forth by federal and state agencies.